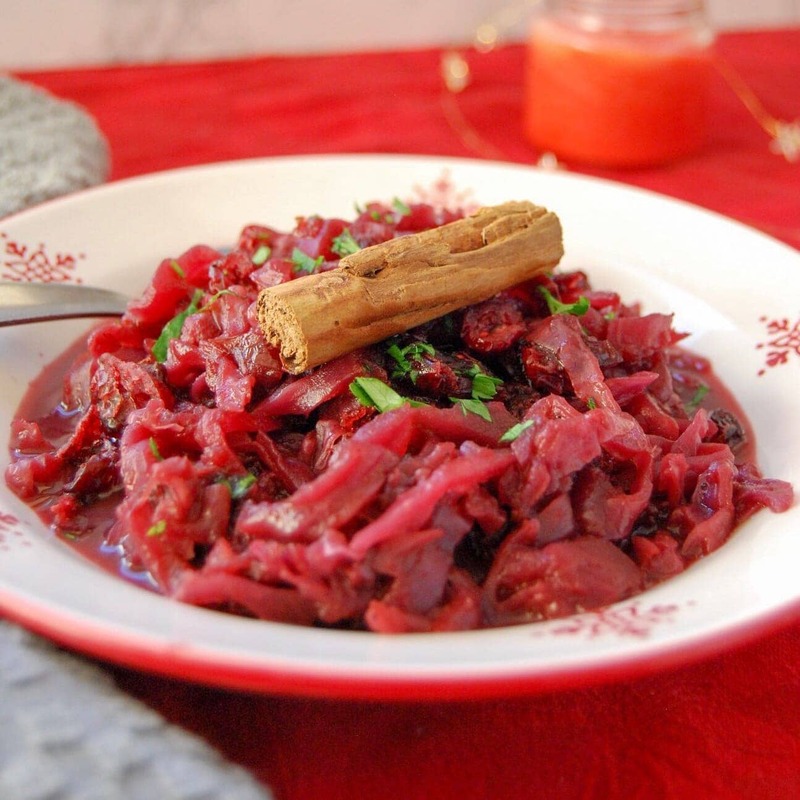 This Christmas spiced red cabbage is slowly simmered with red onion, chopped apples, dried cranberries, cinnamon and ground allspice – it’s a vibrant, flavourful addition to your festive table! And so it has begun. The Christmas adverts are starting to appear on tv. Channel 5 are showing cheesy Christmas movies on a Sunday afternoon starring James Van Der Beek (remember him? Dawson’s Creek?) Last night I caught the first annual sighting of the Coca Cola truck advert. You can’t walk into a shop without seeing a display of Christmas goodies. The most wonderful time of the year will soon be here and as usual, I’m like an over excited little kid. I LOVE Christmas. This red cabbage recipe is the first in a series of festive recipes I’ll be sharing with you over the next few weeks – I can’t wait! Red cabbage was not something that I grew up eating, but I’ve grown very fond of it over the years. It is incredibly versatile – it’s sweet sour flavour sits very happily alongside pretty much any roasted meat. It’s also delicious with sausages – hand me a plate of sausages, buttery mash, onion gravy and a generous helping of this spicy, aromatic red cabbage and you would make me a very happy girl indeed! I like to make a big batch of this cabbage and freeze it in little bags – that way whenever I need some I can defrost it quickly and easily. Red cabbage needs a long, slow simmer to enable all the flavours to merge together. It’s one of the easiest vegetable dishes going – all you need to do is chuck the ingredients in the pan, set it on a low heat and that’s it! Chopping us the cabbage is the only part that requires any real effort. Please note that my recipe is for a medium cabbage – if you are feeding over 8 people, it would probably be wise to double the recipe. I use pomegranate molasses in this recipe to provide a sour note, but if you don’t have any in your cupboard you can use red wine vinegar instead. This vibrant, slow cooked red cabbage has a delicious sweet and sour flavour that goes incredibly well with roast meat or sausages. It's a perfect side dish for your holiday table! Heat the oil and butter in a large saucepan, then add the onion and saute on a medium heat for about 5 minutes until softened but not coloured. Add the the cinnamon and ground allspice and cook for a couple of minutes before tumbling in the shredded cabbage and apples. Pour in the apple juice, light brown sugar, pomegranate molasses and dried cranberries. Stir well, cover with a lid and simmer on a very low heat for about 2-2 1/2 -3 hours - stirring every now and then to make sure the cabbage isn't sticking to the bottom of the pot, adding a little more apple juice if needed. If you wish, you could cook this red cabbage in the oven at 150C in a flameproof casserole dish for 2 1/2 - 3 hours. The cabbage will keep for up to 5 days in the fridge (covered) or in the freezer for up to 2 months. 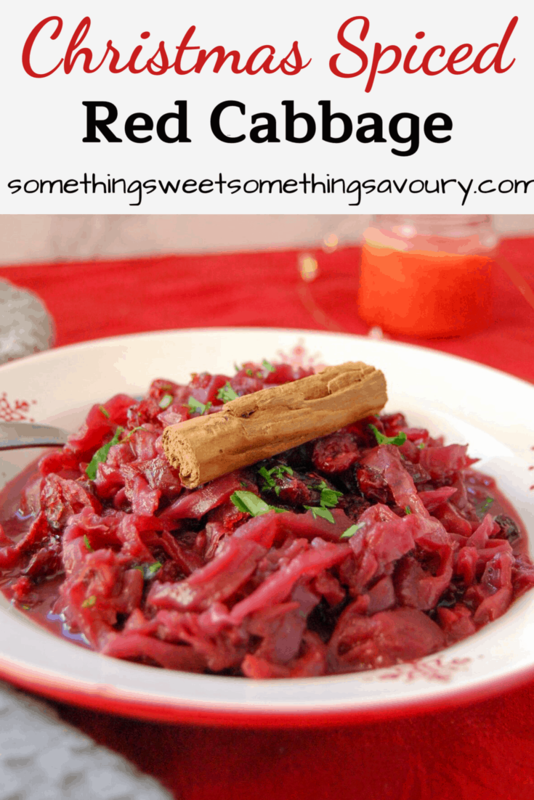 Red cabbage is a highlight of our Christmas food and I’ll definitely be trying this recipe for it. I’m so hungry right now! Trying this without the butter – looks absolutely delicious! I love red cabbage. I used to eat cabbage for the holidays all the time growing up. This recipe sounds so tasty and brings back so many sweet memories for me. It’s my favourite Winter vegetable 🙂 Hope you enjoy it! Thank you Jere, I’m glad it brought you some happy memories ? All the lovely flavour of Christmas! 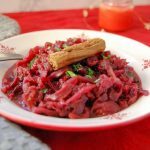 Red cabbage side dish is one that features on our festive table every single year as well and your version sounds and looks delicious Nickki! My Dad would love this, he has red cabbage every Christmas. I might have to make it for him this year! Thank you so much Jo ? Thanks Cat! I’m in agreement with your Dad – can’t have Christmas dinner without it!